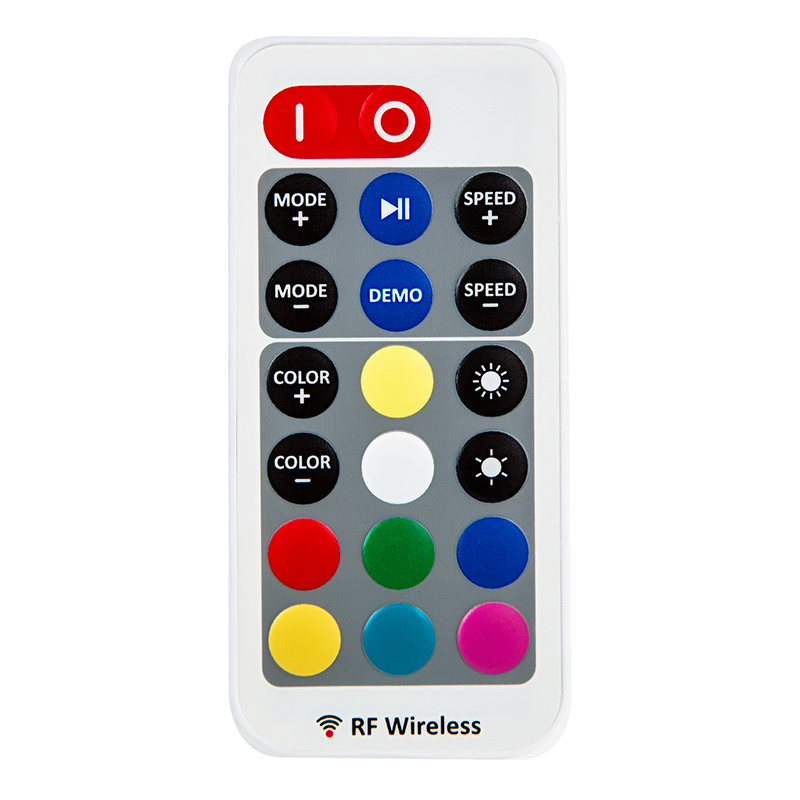 This RGB LED controller with wireless RF remote is perfect for controlling your RGB LED light strips. 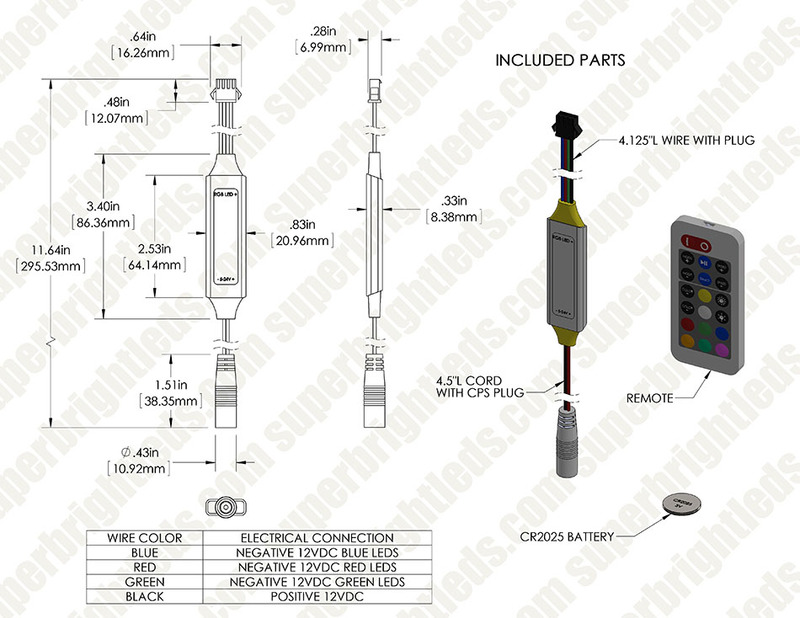 The LED remote can dim light strips from 22%-100% using Pulse Width Modulation (PWM). Choose from 43 dynamic color-changing modes with adjustable speed and brightness levels or 30 static color modes with adjustable brightness levels, and control your light strip from up to 50' away. Power-cycle mode retention allows your light strip to return to the mode that was selected before it was powered off. The waterproof controller has a maximum load capacity of 5 amps per red, green, or blue channel and is compatible with LED light strips that operate within a 5-24V DC range. A male LC4 locking connector easily plugs into the female connector on your light strip. Pair up to 3 remotes with the controller. Includes remote battery. Press ‘I’ key to turn on unit or press ‘O’ key to turn off. Retains last setting between power off and power on. Dynamic modes feature a variety of static color transitions and patterns, with 43 distinct modes. These buttons initiate Dynamic Mode and cycle through the modes in ascending(+) or descending(-) order. Toggles between run/pause when in Dynamic Mode or Demo Mode. Initiates Dynamic Mode if Static Color Mode is currently active. Increases(+) or decreases(-) the tempo of the currently active dynamic mode. Initiates Dynamic Mode if Static Color Mode is currently active. Initiates Demo Mode. Demo Mode cycles through 43 individual modes, repeating each mode 3 times. Initiates static Color Mode and cycle through the colors in ascending(+) or descending(-) order. Increases(+) or decreases(-) the brightness of the currently active static color. Initiates Static Color Mode if Dynamic Mode is currently active. Activates the static color indicated by the button color. These individual colors are also accessible through the Color(+)/Color(-) Static Colors buttons. Flashes blue when remote is operating to indicate that remote is functioning properly. The red cable should be connected to LED positive and black cable to negative. Use LC2 male connector on controller to plug in female LC2 connector on LED strip. The peak output current is 5 amperes. Black(V+): Common anode which connects as the positive (line) connection inside the controller. Red(R): Wire connection for red LED color signals. Green(G): Wire connection for green LED color signals. Blue(B): Wire connection for blue LED color signals. Disconnect the power to the LED controller, wait 5 seconds, and reconnect. Within 5 seconds of reconnecting the LED Controller, press the “50%” and “10%” buttons simultaneously. The LED indicator on the LED controller will flash white 3 times indicating the new wireless remote has been successfully assigned. This may be done for a total of 3 wireless remotes. Within 5 seconds of reconnecting the LED Controller, press the “On” and “Bright (+)” buttons simultaneously. 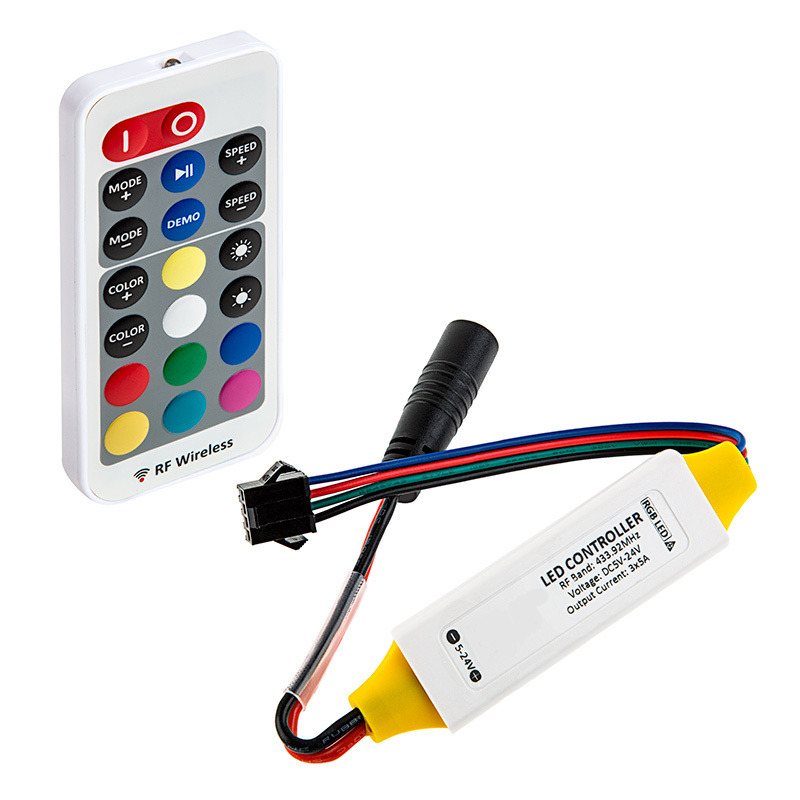 The LED indicator on the LED controller will flash yellow 3 times indicating the LED controller will recognize any remote. Single Device Pairing allows one control hub and and one remote control to communicate as a unique pair exclusively. Multi Device Pairing allows one remote controller to communicate with multiple control hubs within the required transmitting range. If you looking for no thrills light controller this is the product to buy. Great for indoor use for displays, portraits, etc. It was a simple installation for plug and play LED strips lights that have plugs install onto the strip as a set made. 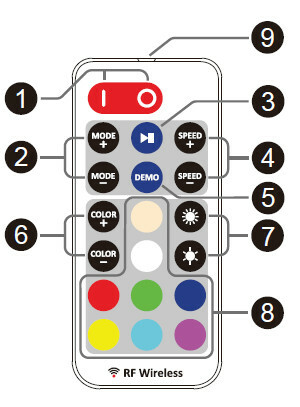 the remote is simple to operate going through any mode, brightness and color changing modes. Picture attach shows one of many colors you can change too with the remote from a distance. 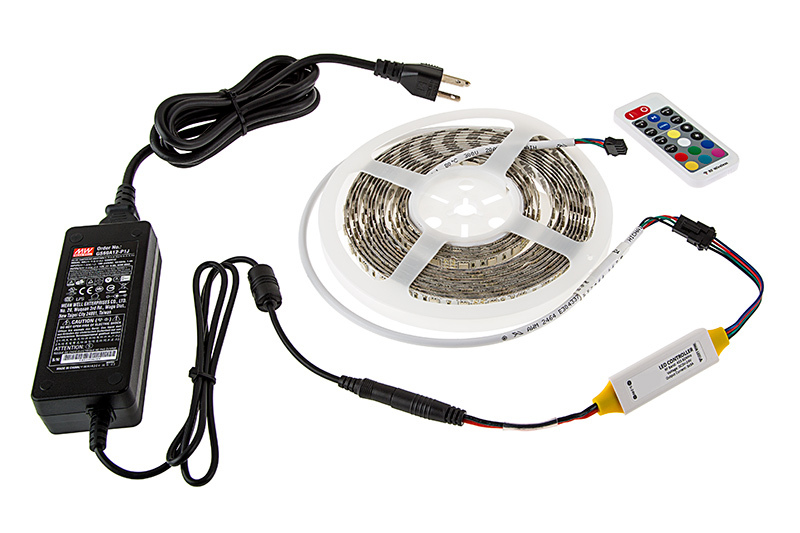 RGB LED Strip Light Reel - 12V LED Tape Light - 101' - High Density - 126 Lumens/ft. Outdoor RGB LED Strip Lights - Weatherproof 12V LED Tape Light - 126 Lumens/ft. Outdoor LED Light Strips with RGB LEDs - Weatherproof LED Tape Light with 9 SMDs/ft. - 3 Chip RGB SMD LED 5050 - 63 Lumens/ft. Outdoor RGB LED Strip Lights - Waterproof 12V LED Tape Light - 97 Lumens/ft.